60° discharge angle, 150° rotation. Discharges drums 19 3/4” diameter x 29 1/2” tall. Heavy-duty continuously welded carbon steel tubular frame. 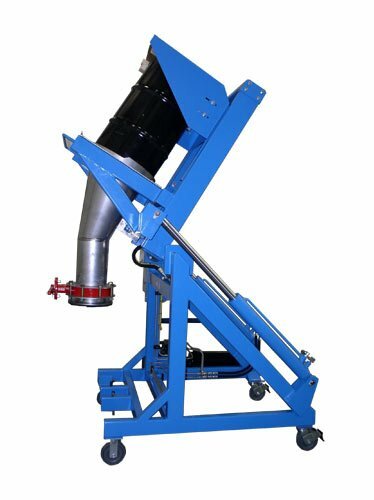 MTS Lift & Seal™ system seals drums to pour cone for dust-tight discharge. Custom designed 304-2b stainless steel cone with continuous welds. 8” diameter manual butterfly valve with stainless steel discharge nozzle. Caster portable design can serve multiple discharge points. NEMA 4 control panel with 110VAC control voltage. “Zero-Force” safety touch system for enhanced operator safety. Side mounted pivot cylinders for smooth, controlled operation.